Our goal is to provide high-quality industry-strength products for our customers. The automation product line is now developed and distributed by qmd4. See qmd4's homepage. This is the new home for statPLC (now called q4PLC) and the web-based IDE for programming IEC 61131. for more information. 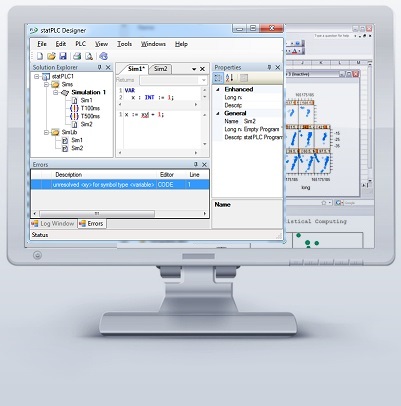 autstat's statistics products are the well-known statconn family of products for integration of statistics software in 3rd party software. statconn's flagship application scExcel is the successor to the well-known RExcel product which was the de-facto standard for combining spreadsheets with the open source statistics software R. scExcel is actively developed by autstat. More than 15 years of experience in both sectors make autstat your reliable partner for automation & statistics. You can find the support forum by clicking support. The download area is available here. To access most of the resources, you will have to log in with your user name and password. Register for a free account if you do not already have one! The current license for scExcel Home&Student expires tomorrow. A new license file is already available for download. Unfortunately the last version of scExcel had expired a few days ago. The new version is available for download now. It contains a few minor fixes. A new functional release is expected end of September.